Françoise-Elisabeth Renaud was born January 17, 1675 in Sillery, Quebec. She was the third child of Pierre-André Renaud dit Locat and Françoise Desportes. 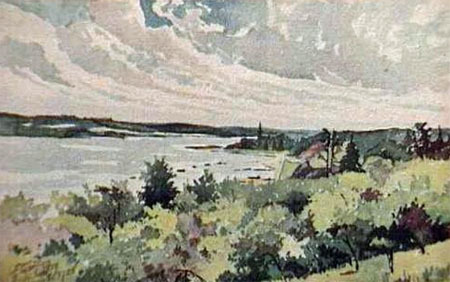 La pointe de Sillery et le St-Laurent, Québec as seen from the Plains of Abraham (painting by Léonce Cuvelier, courtesy Library and Archives Canada). Located just west of old Quebec City, Sillery was the first reserve created by Europeans for Aboriginal peoples in what is now Canada. It was established in 1637 near Québec City. It was funded by a French nobleman, Noël Brûlart de Sillery, in response to an advertisement placed by Father Paul Le Jeune in the Jesuit Relations. Le Jeune was looking for a suitable place to attempt to convert Aboriginal people to Catholicism. His aim was to instill an agricultural lifestyle in the semi-nomadic Algonquin and Innu people of the area in order to more easily evangelize them. The land was granted as a seigneury to Christian Aboriginal people under Jesuit supervision. By the 1670s, alcoholism, epidemics and the difficulties of adapting to a sedentary lifestyle had depopulated the settlement until a number of Abenaki refugees from New England sought shelter there. While her family lived in the low populated region of Sillery, Quebec City had rapidly grown to 1,300 inhabitants by 1681. The whole population of New France around 1675 was 8,000. Françoise-Élisabeths father Pierre Renaud was a military man that traveled to the new world in 1665 under the leadership of Lieutienant-General de Tracy. The main reason 4 companies of regular troops were sent over was to suppress the Iroqoius. This in no doubt why they lived near the Indian reservation and not in the city – crowd control. As she grew up, she and her family endured more conflicts. Less from the Native Americans and more from the British. King William’s War began when Françoise-Élisabeth was 14.In America, the British and the French were already having issues as frontier settlements fought for territorial claims and trading rights. When news of war reached America, fighting broke out in earnest in 1690. The war was referred to as King William’s War on the North American continent. New York and the colonies of New England joined together after meeting in New York City in May 1690 to attack the French in return. They attacked in Port Royal, Nova Scotia and Quebec. The English were stopped in Acadia by the French and their Indian allies. Phips sailed to Quebec from Boston with around thirty ships. He sent word to Frontenac asking him to surrender the city. Frontenac responded in part: “I will answer your general only by the mouths of my cannon, that he may learn that a man like me is not to be summoned after this fashion.” With this response, Phips led his fleet in an attempt to take Quebec. His attack was made from land as a thousand men disembarked to set up cannons while Phips had four warships attack Quebec itself. Quebec was well defended both by its military strength and natural advantages. Further, smallpox was rampant, and the fleet ran out of ammunition. In the end, Phips was forced to retreat. Frontenac used this attack to shore up the fortifications around Quebec. Françoise-Élisabeth Renaud, age 19, married Jean Joubin, age 33 on May 2nd, 1694, in the parish of Grondines. Jean and Françoise-Elisabeth and Jean were married in May, a month later, their first child was born. A daughter, named Françoise-Isabelle was born, but did not survive. On January 29th, 1696, a son arrived; they called him Jean-Baptiste. When another son, François, was born on May 10th, 1698, his godfather was seigneur François Hamelin, co-seigneur of Grondines, indicating that there were close ties between the two families. On April 14th, 1738, at the request of Françoise Renaud, his widow and their son Charles, who was then about twenty-two years old, an inventory and description was made of all their furniture, utensils, clothing, linens, livestock, coin and notes, letters, deeds, papers, information and all other effects of Jean Joubin. Françoise-Élisabeth Renaud died on March 2, 1743 in Grondines, Quebec at the age of 52.